Hi, anyone else getting this error randomly after playing for 5 minutes? I keep getting this error message after a few minutes of playing; causing my SAMP to crash. Has anyone else had this issue before and know how to fix it? Thanks. I don't have any mods installed, and I just got done re-installing the game and samp. Basically update the SA-MP client to the latest one [0.3.7-R2] or rename the GTA_SA directory folder, should sort out the issue. Okay so I figured a way to solve this problem. 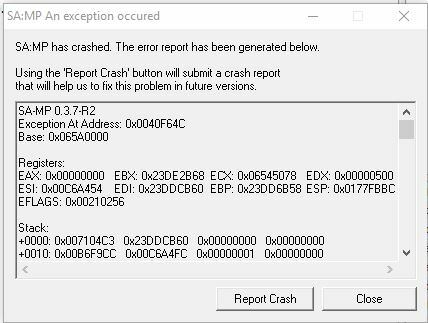 What's causing this problem is whenever a vehicle explodes in the server which makes your game crash.